Cherrapeno: Announcing SHF #60: The Holiday Edition! It's December!! It's the party season - that time of year when we can go to town on our desserts - and I want YOU to join in! 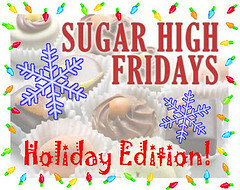 I'm hosting December's edition of Sugar High Friday (SHF), a blogging event created by Jennifer of The Domestic Goddess, where the participants create, cook and photograph something sweet within a theme. This is SHF no. 60 - wow, has it really been going that long?! December's theme is 'holidays' - how easy is that? I'm sure that most of you will be making something sweet to eat during the festive period, or a special dessert to take to a party. This is your chance to show off your holiday sweet treats, dress them up and impress everyone! Make your sweet holiday offering between now and Monday 28th December. Take a photo and post about it on your blog, remember to include a link to this page (if you don't have a blog you can still enter, see below). If you don't have a blog and would like to take part, you can post your recipe in the comments section or email it to me with a picture of your dessert as above, so that I can include it in the round-up. Submissions must be in by Monday, 28th December 2009, or they will not be included in the round-up! A sweet food blog event, thanks for introducing me to this. I will have to give it some thought and maybe have something to submit. Oh, that sound so great ! count me in Nic ! aaaah,...Good for you for hosting!! Count me in!! That's a great event! Hello! We used to have something like that in Melbourne. Now that I've moved back to Singapore, I totally miss it! Thanks for sharing the photos! Sounds good. Will see what I can do. Not too sure what the word holiday means though. Sunita - will look forward to it! Mangocheeks - hope you do submit something! atdownunder & Sophie - great! Vickys - I'm thinking you mean the Good Food Show? Shame they don't have one where you live. James - ha ha, another one snowed under this year?! I just sent mine in! Happy Holidays! Just mailed in my entry.